Introduced in 1983 by Zoe Motors Inc in Los Angeles, California (USA) the Zoe Zipper was a light weight one seater vehicle weighing in at under 400 pounds. It was initially manufactured by Mitsuoka Motors in Japan in 1982. The vehicle was powered by a 5hp (49cc) Honda engine that provided power to the single rear wheel. The Zoe Zipper had a top speed of 45 mph (72 kmh) and offered fuel consumption of anything up to 112 mpg. The body was made of fibreglass and came in two versions, a hardtop and a convertible. 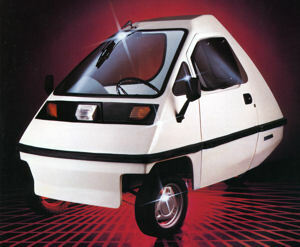 Also in 1983 the Zoe Little Giant was also introduced. Again powered by a 49 cc Honda engine the Little Giant was a mini pick-up truck that could carry a payload of half a ton. The 1983 Zoe Zipper. (My thanks to Doug Tuttle for sending me a brochure on the Zoe Zipper from the 1983 Los Angeles Auto show that provides the info and image for this page).